Ok, how are we ALREADY half way through 2017? If you feel like you need a good crafty catch up, this is totally the place to be! In our Summary, we have picked our top nine tutorials from with the added surprise of hidden templates and downloads ready for you to use! Our Free papers are always super popular and this month’s were no exception! Succulents and pastel colours are so trendy right now so we created 5 snazzy designs and a page of toppers to accompany these pretty papers. 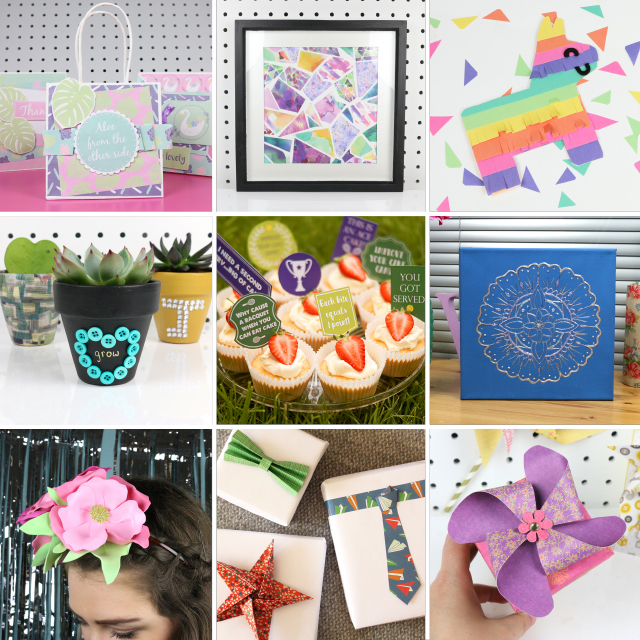 We got cutesy with our card shape this month as we showed you how to use our free template to create this colourful, textured piñata card that would be wonderful to use for a variety of occasions. If you love to get your fingers green, we had the perfect tutorial showing you how to upcycle your plant pots with a few crafty products to really make them stand out both in and outside your house! Wimbledon is nearing (whoopee!) So the talented Elle Townsend put together a yummy tutorial showing you how to use our free tennis inspired toppers on her scrumptious strawberry and cream cupcakes! We love how elegant Henna design is so we created a template for you to follow to create your own wall art piece with the Dovecraft Pearl Effects glues. The different colours and patterns really makes this project pop! Festival season has arrived so to make sure you’re suited and booted for your next concert, we have shown you how to use our free template to create your own flower headband to help you stand out in the crowd! We loved our guest feature from Mike Aspinall of The Crafty Gentleman who showed us how to create the coolest toppers for Father’s day gifts and every day presents! Pinwheels are fantastic for bringing a summery feel to your makes so Maxine took you step by step to create your own so you can incorporate this fab look to cards and home décor projects. Which was your favourite tutorial or download from June? We’d love to see your makes so don’t forget to share your crafts in the Inspiration area and to #trimcraft when uploading to social media.